Homelessness is a grave problem in some parts of America. It’s common to come across people on the streets without food, shelter and protection from the harsh and cold climate during the winter. But small random acts of kindness can make a difference in the lives of the homeless. 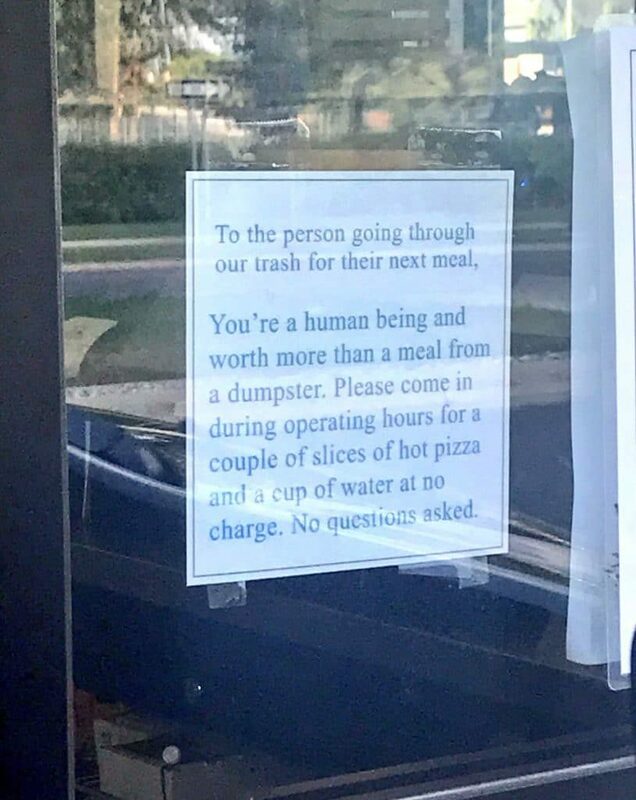 When the owners of a pizza store chain in Fargo, North Dakota, spotted a homeless guy going through their trash bin, they realized they could take action instead of confronting the stranger or sending out just thoughts and prayers to the needy, as most people do. 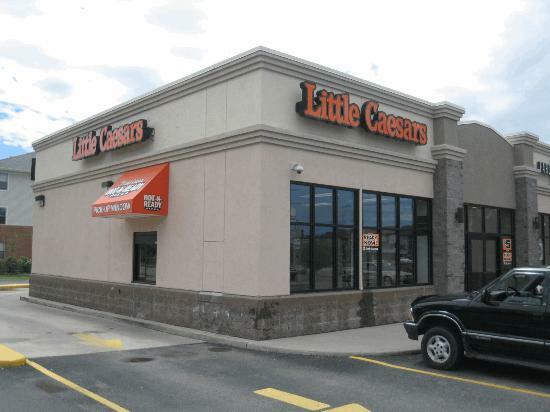 Jenny and Mike Stevens opened the Little Caesars franchise on 19th Avenue at the northern neighborhood in 2015. The couple and their two daughters, who were also working at the store, would often see homeless people outside their pizza place. There were times when the Stevens would offer food for the homeless wandering near their storefront. The family, however, realized that this was a bigger problem and not a random instance after they spotted a homeless person looking for food at the dumpster behind their store. It dawned on the Stevens that this was a common occurrence. So, they thought of hanging a unique door sign on their storefront for the benefit of the homeless. The sign was an invitation for the homeless to come inside the store and have a slice of warm pizza and a glass of water at no cost. The store workers assured the homeless that they will not be asked or interrogated for coming in to have a free meal. 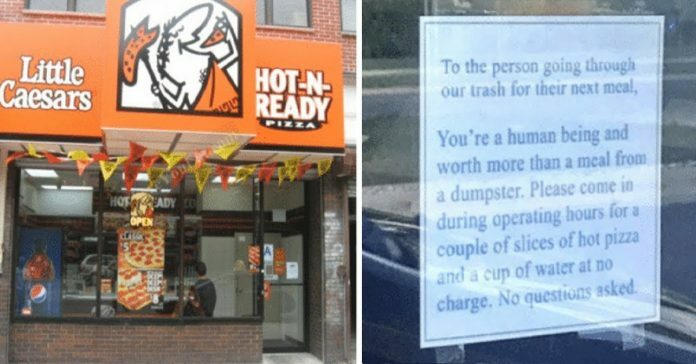 Little Caesars management said that they don’t want the homeless going through the dumpster for food. Despite their circumstances, they are still human beings who deserve to be treated with dignity. The Stevens even extends their generosity to those coming to the store for donations. They would gladly offer a whole pizza box and not just a slice of pizza. A year after opening their store, the Stevens’ Little Caesars franchise partnered with a local homeless shelter to supply free freshly-baked pizza regularly. Their help soon reached three more shelters in Fargo. Shelter volunteers come by every week to pick up the boxes from the Stevens. Some of the homeless even come by to tell the staff that they look forward to pizza night at the shelters. Sadly, Mike passed away in 2017 after battling with leukemia. He was 66 years old. His wife, however, still continues to do the great deed they started together. As of that year, this Little Caesars franchise in Fargo has given away over 140,000 pizza slices or about $70,000 worth of pizza to feed the homeless. To sustain their feeding program, the Stevens have also set up a fundraiser. Jenny said that they need to keep this going in honor of Mike’s memory. At the height of his sickness, he apparently didn’t slow down to prepare the pizza because he knew how much it will make a difference in someone’s day.